By the time I became aware of this, the pile-on had already started. I held off on commenting because it seemed like all the interesting rhetorical gambits had already been played. Some might dismiss this as chutzpah from someone who, like Barack Obama, opposed the surge needed to stabilize the situation in Iraq. But, brazen or not, it’s great to see the Obama administration taking ownership of Iraq and realizing that simply pulling out all our troops can’t be the sole goal of our policy there. Yes, except I don’t think an unscripted comment from Biden, a walking gaffe machine, is necessarily a reflection of the administration’s thinking. [T]he administration’s achievement is no more astounding than Bull Connor’s passage of the 1964 Civil Rights Act, Kruschev’s reunification of Germany, or Jefferson Davis’s preservation of the Union. But after thinking about it for several days, I started to realize that Biden was right. Bear with me here, and think about the fact that after more than a year in office, the Obama administration has not screwed up what the Bush administration achieved in Iraq. Of course, when you put it that way, it sounds kind of dismissive toward Obama. But I assert that “not screwing up Iraq” is a non-trivial achievement — and certainly a much better outcome than many of us feared before the election. Well, he did successfully nationalize two of the Big Three automakers. [Update: Not to mention porkulus!] Hm… what’s the opposite of an achievement? For much of the past eight years, American and NATO forces have mounted other large military operations to clear towns and cities of Taliban insurgents. And then, almost invariably, they have cleared out, never leaving behind enough soldiers or police officers to hold the place on their own. And so, almost always, the Taliban returned — and, after a time, so did the American and NATO troops, to clear the place all over again. “Mowing the grass,” the soldiers and Marines derisively call it. This time, in Marja, the largest Taliban stronghold, American and Afghan commanders say they will do something they have never done before: bring in an Afghan government and police force behind them. American and British troops will stay on to support them. “We’ve got a government in a box, ready to roll in,” said Gen. Stanley A. McChrystal, the top American commander here. There are no guarantees, of course — the Afghan “surge” may fail. But if it does succeed — and as in Iraq, I define “success” in Afghanistan as a reasonably stable, reasonably self-sufficient, democratic government allied with the United States — then I’ll be happy to give Obama credit for that achievement. This entry was posted in Uncategorized and tagged Afghanistan, Iraq, Obama by Kirk Petersen. Bookmark the permalink. I think the achievement is that Obama didn't give in to the demands of the far left (on this issue) and immediately pull our troops out of Iraq. He continued with the successful strategy implemented by the Bush administration. So in a way, it is an achievement, but it's not in the traditional sense. For Biden to try and take ownership of the success in Iraq is a bit disingenuous. It would be like the last runner in a relay race claiming he won the race for the team because he was the one who crossed the finish line. If the previous runner in the relay built up such a large lead that the last runner only had to preform a easy jog to maintain the lead a win the race, who really one the race? The one who crossed the finish line or the one who did the majority of the hard work? My point exactly. In your example, the team won the race — one runner may have contributed more than the others, but any of the others could have lost it, and yet they all held their own. Obama absolutely had the power and authority to abandon Iraq. I'm not quite ready to declare Iraq a "win" yet, but if we win, it will be an American win — and I'll give Obama props for doing his part. Seems to me that the fact that we're still in Iraq is a broken campaign promise on the part of Dr.O. 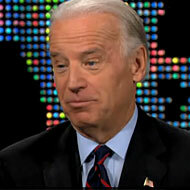 The achievement Biden refers to is the growing number of broken promises his boss has made. Don't get me wrong I'm glad we stayed and made good on our promises as a nation.But Obama has done little but criticize and rebuke Bush for the entire war until it looks like it might have a positive outcome.